Already in 1889, Brentano formulated the project of publishing a work entitled “Descriptive psychology” (Brentano 1889, vi/1902, viii). In the meantime, transcriptions of his lectures circulated among his students. The work never came out as a book during Brentano’s lifetime. A few decades later, Oskar Kraus, a ‘grand-student’ of Brentano, apparently made a first effort to publish the lectures under the auspice of the ‘Brentano Gesellschaft’ in Prague in the 1930s. This project never came to light. 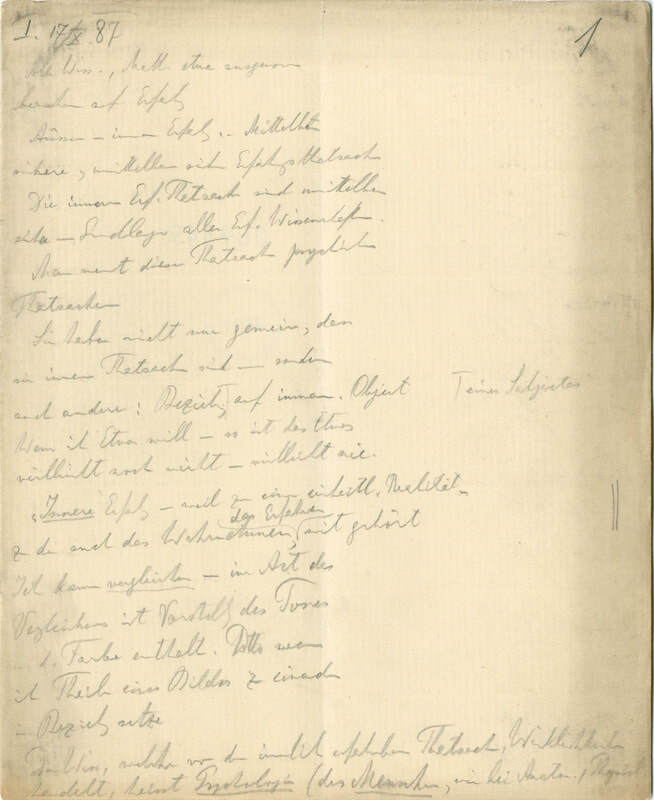 In 1982, independently of Kraus’ preliminary work, Roderick Chisholm and Wilhelm Baumgartner prepared an edition of third Vienna lecture (EL74) (Brentano (1982/1995a)), augmented with small excerpts from other lectures and unpublished manuscripts. As explained above, Brentano (1982) only offers a fragment of the whole DPRP. In manuscript pages, it represents about the quarter of the whole descriptive psychology lectures. Many issues concerning the nature of sensations and the contents of perceptions, which are extensively dealt with in the two first lectures, are not addressed in the third lecture. This makes an edition of the two first lectures necessary. Brentano (1982) and its translation (Brentano 1995a) provide a very well readable text and a profitable introduction to Brentano’s DPRP. However, from an editorial perspective, and from the perspective of a reconstruction of DPRP, the edition has some problems: 1) It takes the original manuscript as a starting point, but the edition doesn’t follow the structure of the manuscript. Some pages and sections belonging to later parts of the manuscript are inserted in earlier sections of the edition, without any mention of this editorial intervention; 2) Sentences from the manuscript are missing in the edition; 3) Brentano’s own editorial comments in the manuscript (e.g. marginal notes commenting the content) are inserted by the editors as constitutive parts of the text, without any mention of this editorial intervention, and finally 4) whole sections from the manuscript (on a first approximation, at least 10%) are missing in the edition. For these reasons, a theoretical and editorial reconstruction of DPRP as the one projected here should also include, along with the two first lectures, a new edition of the third Vienna lecture in it entirety. 1) Brentano’s lecture “Descriptive Psychology” (Ps 76): This manuscript bears the date 1887–88. It is the first and the lengthiest of Brentano’s lectures (733 pages) on descriptive psychology in Vienna. The lecture consists of one layer, which makes it relatively easy to edit. It is written in Brentano’s own hand and for the most part very legible. This lecture will be transcribed and encoded on a contractual basis (see section 4.2), in order to publish it as a volume. 2) Brentano’s lecture “Descriptive Psychology or Descriptive Phenomenology” (Ps 77): This manuscript bears the date 1888–89. It is a much shorter lecture manuscript (136 pages) that deals at length with the contents of sensations. This manuscript is also single-layered and written in Brentano’s own hand. Its legibility is comparable with Ps76. 3) Brentano’s lecture “Psychognosy” (EL 74): This manuscript bears the date 1890–91 and has 336 pages. Like the two first lectures, EL 74 is a single-layered manuscript. As with the two first lectures, it will be transcribed and encoded on a contractual basis (see section 4.2), in order to be published as a volume. 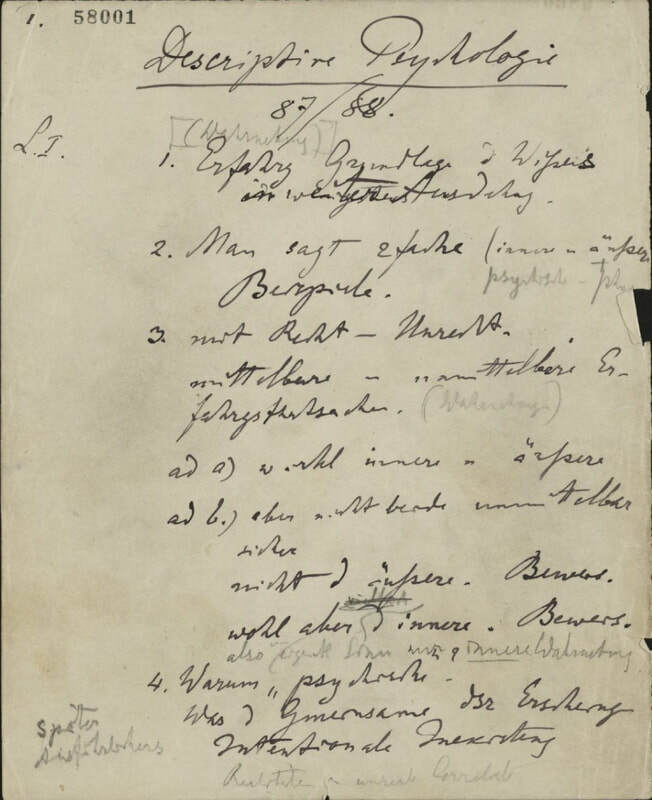 Husserl, who did not attend the lectures, had made a handwritten copy of the lecture notes of Ps76 taken by his colleague Schmidkunz. This handwritten copy is deposited at the Husserl Archives in Leuven under the signature Q10. As soon as 1889, Anton Marty started to propagate DPRP in his own lectures in Prague. See Marty (2011) and Antonelli (2011). 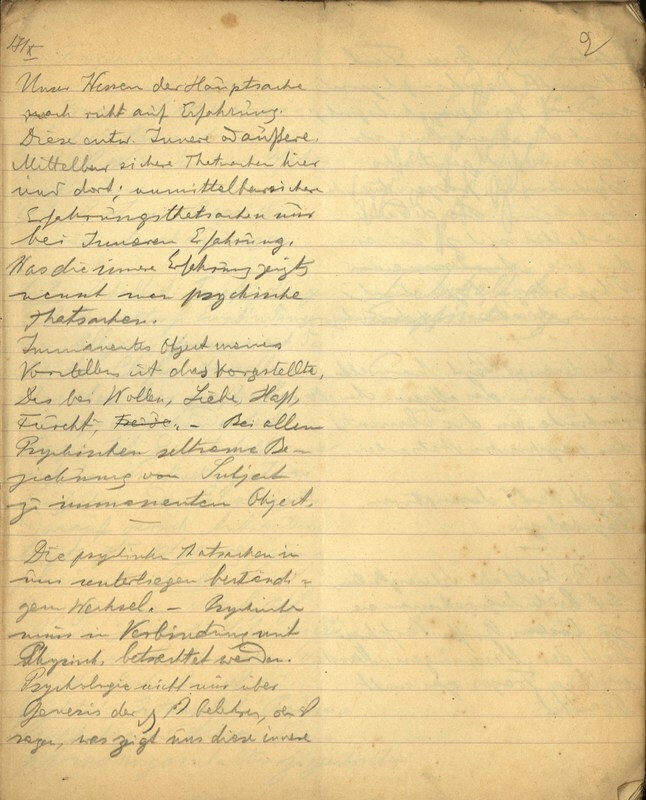 A table of contents, written most likely by Kraus, has been later adjoined to EL74 (see EL 74, pp. 12916-12921) together with another piece of manuscript dated from 1929/1930. On the edition projects conducted by Kraus and the Brentano Gesellschaft, see Kraus (1937) and Binder (2000). See for instance Brentano (1982, 20), where the first paragraph of the page belongs to EL74, 12658. The second paragraph of the page continues with EL74, 12666. Parts of the 8 omitted pages then appear on p. 22f., but the insertion by the editors of a section on distinctive parts (EL74, 12666f.) does not correspond to the structure of the manuscript. See for instance the sentence “Urtheil ist ein logischer Theil von Bejahung, eine Gattungsbestimmtheit” (EL74, 12667) which is missing in the last paragraph of Brentano (1982, 20). A whole paragraph from EL74, 12716 is missing in Brentano (1982, 40). See for instance Brentano (1982, 37), „(Besser vielleicht umgekehrt!)“. Compare with EL74, 12708. See for instance EL74, p. 12850a, where Brentano discusses the possibility of a double proterose. This section is absent in Brentano (1982). The same holds for EL74, 12878a. Furthermore, a detailed critique of Stumpf has been omitted (EL74, 12898f.) after the passage ending with “was widerspräche…” in Brentano (1982, 119). Finally, the last 27 pages of the manuscript have been left out in the edition (EL74, 12900a – 12921). Transcription of the Introduction to the first lecture.